This laboratory report from a urine sample graphically illustrates the problem of increased resistance. The patient presented with the symptoms of a urinary tract infection (UTI): the desire to pass small amounts of urine very frequently, accompanied by burning pain. This is a very common problem for women and standard management is to treat the infection ‘blind’ without sending a specimen to the laboratory. In children and in men UTI’s are uncommon and can be associated with significant underlying problems and so when they develop these symptoms a specimen must always be sent to the laboratory and the problem reviewed again after treatment has been given. In this case a specimen of urine was sent to the laboratory and revealed a highly resistant E. Coli bacterium. 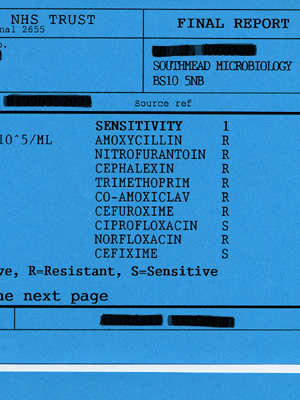 On the right hand side of the form is a list of antibiotics that it has been tested against. An R after the antibiotic name denotes resistance, an S denotes sensitivity. This particular bacterium is resistant to seven antibiotics. Fortunately there are two to which it is still sensitive and these can be used to treat the infection.